Last year's 'The Light' from ReinXeed never quite gripped me. It was a good debut, but still formulaic Euro power metal. 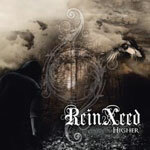 Lead and powered by Tommy Johansson, ReinXeed's version of power metal is fast-paced, melodic, and heavily keyboard laden. This is not exactly a novel or different approach to the genre. This year's 'Higher' hopes to transcend the former outing but, with a few notable diversions, follows the same power metal recipe. The differences this time around are good ones. First, whereas before they were nearly inconsequential, the guitar solos have a stronger presence and role. Take note of the fret work on 'Star Shine' and 'Dragonfly.' Second, though Johansson's vocals often err on the side of annoying and piercing jousts into the stratosphere, this time around the lead vocals are more contained and the vocal arrangements more eloquent and defined. 'Always Be There' and 'Light Of The World are both good examples of this trend. Finally, here and there, the arrangements show greater variation. Mostly it's typical power metal, but on songs like 'Dragonfly' and 'Reality' there is enough changes to reveal a glimmer of prog metal. In the end, the bulk of 'Higher' is straight up, galloping, double-kick drums and synthesizer laden power metal, plain and simple. Yet, in the masterful hands of ReinXeed it's done with enthusiasm and excellence. 'Higher' rises above last year's 'The Light' with ease and assurance. The bulk of 'Higher' is straight up, galloping, double-kick drums and synthesizer laden power metal, plain and simple. Yet, in the masterful hands of ReinXeed it's done with enthusiasm and excellence. 'Higher' rises above last year's 'The Light' with ease and assurance.